SAN MARCOS (4-20-2017) – Palomar College freshman left-hander Ryan Semon did something very few hurlers have done all season. Semon came out of the bullpen to shut out Grossmont over the last 4 innings as the No. 7-ranked Comets defeated the No. 10 Griffins, 4-2, at Palomar College Ballpark Thursday afternoon to even the teams’ Pacific Coast Athletic Conference first-place baseball series at a game apiece. Palomar (28-7, 18-2 PCAC) moved back into a first-place tie with the G-House (25-7-1, 18-2 GSAC) going into the rubber game of the 3-game series at noon Saturday at Grossmont’s Noel Mickelsen field. Grossmont grabbed a run in the first when ROBERT BOSTADT drove in DAVID MALDONADO with a sacrifice fly. After the Comets scored in the top of the sixth, the Griffins showed their moxie once again by re-grabbing the lead on a RBI single by JUSTEN BURKEY, who had three hits on the day. The Comets pulled even in the bottom of the sixth on walk to Conor McKenna, Gabe Willes’ sacrifice bunt and Jared Montoya’s single to rightfield that scored McKenna. After Semon took just 4 pitches to set Grossmont down in the top of the seventh, aided by a pair of spectacular defensive plays by McKenna at third base, Palomar went ahead for the first time in the bottom of the inning. Cameron Haskell and Grant Buck hit back-to-back doubles to right with two outs. Buck drove in Haskell to put the Comets on top 3-2. Palomar added an insurance run in the eighth inning on a walk to Willes, Montogya’s sac bunt, a walk to Tristan King and Joey Cooper’s 2-out double to left-center field that drogve in Willes. 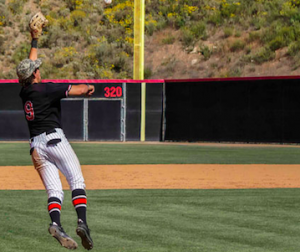 Semon (9-0, 1.40 ERA) relieved Palomar starter Nate Stilinovich, who also pitched effectively after Stilinovich faced the leadoff batter in the top of the sixth. 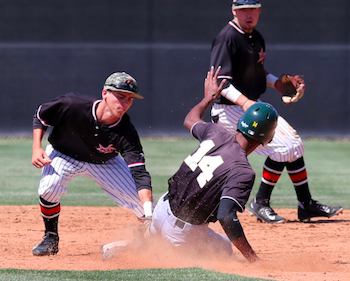 After Grossmont stopped Palomar’s 14-game win streak in the opening game of the series on Tuesday, the Comets returned the favor in this one, stopping the Griffins’ 10-game stride. DONAVON MCCRYSTAL was tagged with the loss, allowing a pair of earned runs over 6 2/3 innings. Bostedt,Robert flied out to lf, sacrifice fly, RBI; Strohl,Noah advanced to second; Maldonado,David scored. Montoya, Jared reached on a fielder’s choice, RBI; Willes, Gabe out at second 2b to ss; Buck, Grant scored, unearned. Burkey,Justen singled to right field, RBI; Miller,Mitchell scored. Montoya, Jared singled to right field, RBI; McKenna, Conor scored. Buck, Grant doubled to right field, RBI; Haskell, Cameron scored. Cooper, Joey doubled to left field, RBI; King, Tristan advanced to third; Willes, Gabe scored.